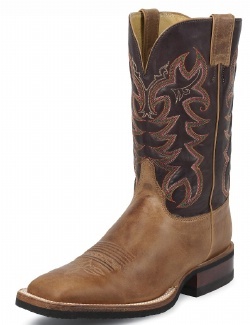 Anderson Bean Cognac Big Bass boots have been handcrafted in Mercedes, TX since 1989 out of the finest leathers. We choose the best top and bottom combinations on each boot we design. Wood’s Boots carries an extensive line of Anderson Bean Boots including the Anderson Bean Cognac Big Bass. We offer our customers 6 colors to choose from. These Anderson Bean Big Bass boots are double stitched, 3/4 welt with a wide square toe, walking heel, and leather soles. They have a turquoise mad dog top and a six row stitch pattern. The Big Bass is an actual fish from the Amazon. Pirarucu (Arapaima gigas), also called arapaima or paiche , ancient, air-breathing, giant fish of Amazonian rivers and lakes. One of the largest freshwater fishes in the world, the pirarucu attains a length of nearly 3 metres (10 feet) and a weight of 220 kg (485 pounds).